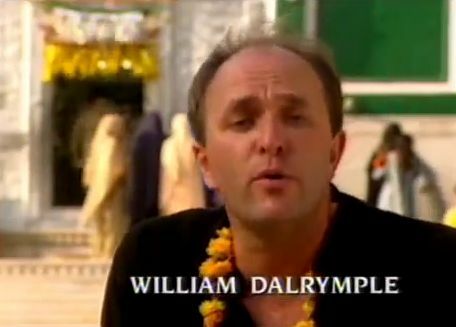 William Dalrymple, a British historian specializing in the history and cultures of South Asia and the Middle East and one of my favourite writers, wrote and presented the material for the documentary film, Sufi Soul: The Mystic Music of Islam (2005) . 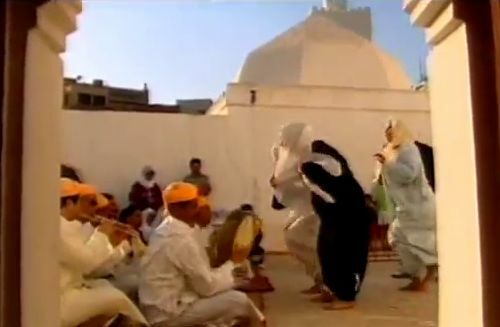 Dalrymple’s principal thesis, presented here in the made-for-TV film directed by Simon Broughton and photographed by Chris Vile, is that music is a fundamental element of Sufism and a key to its practice. What I particularly like about Dalrymple is his appreciation for the unique contributions that Indic cultures have made to the world . The fact that he has lived for much of the past twenty-five years in India undoubtedly contributes to his deep understanding of Indian culture. In particular, Dalrymple is sympathetic to suggestions that Indian notions of nonviolence (including vegetarianism), meditation, and oneness-with-god (think of Yoga, Buddhism, Jainism, etc.) have made their way into Western spiritual thinking via Gnosticism and Sufism. Sufism, then, is the Islamic practice that encompasses this syncretism of Eastern and Western spirituality. 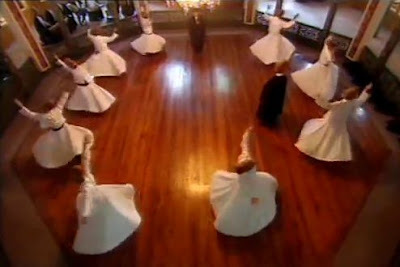 A key element of Sufi practice is its use of music to bridge the mind-body split that characterizes conventional, orthodox religions. Orthodox religious thinking uses text, privileged though it may be, to express its knowledge, including esoteric knowledge. Words evoke abstractions and categories that enable us to build lexical and narrative models of the world. But words necessarily establish a separation between us and the world “out there”. Music, on the other hand, temporally unites consciousness and our physical being into a unified embodied presence. And this, in particular, is what Sufi music emphasizes. Over the course of this film, Dalrymple outlines this idea in various contexts. He then moves on to examine Sufi music in various areas of the world. 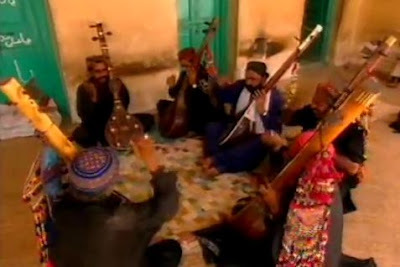 In all those locations, the film shows local Sufi music that is designed to contribute to a spiritual rapture of the listeners. Travelling to Syria, Dalrymple witnesses Sufi music in Aleppo, where the musicians repetitively beat on drums in order to bring themselves to a psychic state closer to God. Then he goes on to discuss the origins of Sufism in the deserts of that region. ‘Suf’ is the Arabic word for wool, and the word evokes the image of the “Desert Fathers”, who were early (third century CE) Orthodox Christian hermits who wished to abandon the growing rigidity of orthodox Christianity and find enlightenment and communion with God by being alone in the desert . The Desert Fathers may well have been influenced by the Gnosticism that emerged in Egypt in that era and whose extant documentation is comprised mostly by the Gnostic Gospels discovered only relatively recently in Nag Hammadi, Egypt, in 1945. Second, the "living Jesus" of these texts speaks of illusion and enlightenment, not of sin and repentance, like the Jesus of the New Testament. Instead of coming to save us from sin, he comes as a guide who opens access to spiritual understanding. But when the disciple attains enlightenment, Jesus no longer serves as his spiritual master: the two have become equal--even identical. Jesus said, "I am not your master. Because you have drunk, you have become drunk from the bubbling stream which I have measured out.... He who will drink from my mouth will become as I am: I myself shall become he, and the things that are hidden will be revealed to him." The precise origins, instances and modes of influence can be disputed, but there is no doubt that given the travel and trade between the East and West in those times, there was likely awareness of Buddhist and Christian ideas in the Middle East that predates the rise of Islam and were incorporated into Islamic doctrine. An example Christian influence mentioned by Dalrymple is the Lenten Feast that became Ramadan in Islam. Whereas orthodox religionists always wish to emphasize the exclusivity of their religious message, Dalrymple is the syncretist and wishes to emphasize the commonality among religions. After covering Sufism’s origins in Syria, he travels to Konya, Turkey, the home and tomb location of the 13th century Sufi mystic, Jalal ad-Din Muhammad Rumi (“Mawlana”, aka “Mevlevî”). There is due coverage of the famous Whirling Dervishes, but the Turkish government’s attitude towards Sufism is problematic. It is willing to exploit the fame of Rumi’s poetry and the tourist attractiveness of the Whirling Dervishes for monetary gain, but it has outlawed Sufism as a religious practice since Kemal Ataturk banned Sufism in 1925. 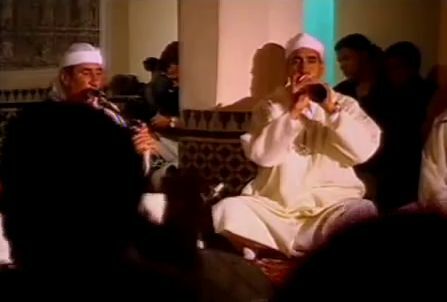 Nevertheless, there are still underground Sufi groups today, and the filmmakers manage to film one of their clandestine sessions. Note that although Rumi is the most famous Sufi poet in the West, the focus here is not so much on his poetry but more on Rumi’s favourite musical instrument, the ney, which is a reed flute. Dalrymple speaks with and listens to a famous ney player, Kudsi Erguner, as well with a modernist musician, Mercan Dede, who combines his own ney-playing with electronic music, thereby achieving a kind of fusionist rock blend. Dalrymple travels to Lahore, where he watches the dhol drum players beating on their drums while they whirl madly about in circles. This is less ritualised than the Turkish whirling dervishes and more a mad, extemporaneous dance. 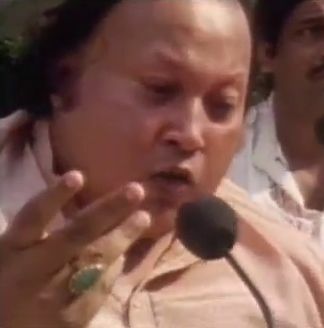 He also shows some footage of Nusrat Fateh Ali Khan, who was a celebrated singer of the Qawwali, the devotional music of Sufism in South Asia. 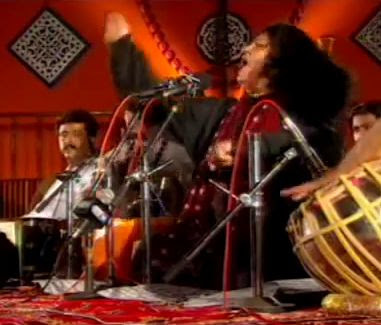 Again, we see that Qawwali singing has the extemporaneity of jazz singing. They visit the tomb of Amir Khusrow, a 13th century Sufi musician and the creator of qawwali music. He is buried in a tomb next to his master, Nizamuddin Auliya, a famous Sufi saint. Their tombs are a place where Muslims, Christians, and Hindus all come together to pray. Throughout all the Sufi music played in the various regions visited over the course of the film, there is a commonality to the music, despite its customization to the local musical instruments and cultural modes of the regions. This common feature I refer to is the relentless, almost trance-inducing, rhythms that are created, both vocally and by means of the instruments. What this produces is a form of embodied meditation, if you are in the right mind. The important thing is for the music to conjure up feelings of love and harmony that overcomes reflective thought and critical judgement. It is by this means that the Sufi soul is invoked. It is available for viewing on YouTube. Try looking here. William Dalrymple, "The Great & Beautiful Lost Kingdoms", The New York Review of Books, (21 May 2015). William Dalrymple, "The Great Divide: The violent legacy of Indian Partition", The New Yorker, (29 June 2015). See also: "The Two Religions", The Film Sufi, (2015). “Desert Fathers”, Wikipedia, 23 May 2015, http://en.wikipedia.org/wiki/Desert_Fathers. Elaine Pagels, The Gnostic Gospels, (1979), Vintage Books, pp. xiii-xxiii, extract cited in “Frontline: The Gnostic Gospels”, The Public Broadcasting Service, (April 1998), http://www.pbs.org/wgbh/pages/frontline/shows/religion/story/pagels.html. Watched the documentary after reading this great piece... and I am really glad that I did! VERY disappointing watching this movie. How the movie fails to mention that the birth place of Rumi was in fact part of the Persian Empire now reduced to Iran and how Rumi's poems are written in one of the most beautiful poetic languages aka Farsi/Persian and how Rumi is in fact not Turkish but Persian. Or how Darvish is a Persian word and Ney is a Persian instrument. The movie fails to cover Iran at all also not mentioning that the biggest Sufi population is actually in Iran and some of the most beautiful mystical Sufi music comes from Iran given Rumi's poems are Persian. If you can't film in Iran, the least you could have done is to showcase the music or mention it. Finally understood what sufism means through this documentary.